A major new Star Trek book: full-color large format book on Star Trek: The Next Generation. 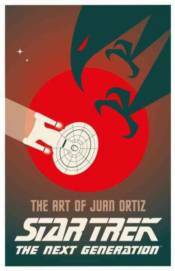 Following on from Juan Ortiz's fabulous Original Series poster collection, this latest treat for art-loving Trek fans features 178 posters that capture the essence of The Next Generation. Inspired by indie-film and black-light posters, comics and rock/punk culture and showcasing Ortiz's unique creative vision, this new installment of original Trek art is sure to delight fans worldwide.